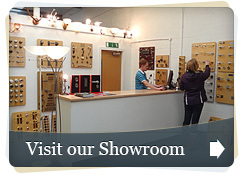 The terms "us", "we" and "Cheshire Hardware Ltd" refers to the owners of this website. The terms "you", "your", "the customer" or "the buyer" refer to the user or viewer. Delivery is only arranged once full payment is received. Orders recieved and confirmed after 3pm or at weekends will be processed the following working day. Unless otherwise advised, delivery is normally made within 3 working days other than non-stock items. "In Stock" means that the product (or a version of it) is in stock either at Cheshire Hardware or at works. Usually this will not effect delivery times but some products will require assembly or finishing which can extend delivery times. The standard UK mainland delivery charge on orders under £100 is £7.50. There are areas where this will be increased however and we will inform you of this once your order is placed if you have not called to ask first. Examples are Northern Scotland, Northern Ireland, Scottish Islands, Isle of Wight, Isle of Scilly, Jersey and Isle of Man. These will carry an additional cost based on the size of the consignment regardless of the order value. If the lead time of your order is expected to be longer than 3 working days from receipt of your order, we will contact you with an estimated time of delivery. Delivery is normally on a weekday day between 9am-5pm. Special timed or Saturday delivery can be arranged at an extra cost which will be arranged upon agreement of the cost by the customer. We will despatch your order using the courier company and method we feel is most suitable for your goods, and the conditions of delivery for the elected method will be applied. For example, if a signature proof of delivery is required by the courier company, this condition must be met before the goods are delivered. You must not schedule or commence installation until all goods are received and their suitability for fitment is confirmed by you and we will not be held responsible for any loss or damage caused by the fitting of unsuitable, faulty or incomplete products. All Pricing for delivery is for the UK mainland only with certain exceptions. We will re-quote for other destinations and special delivery options. Delivery charges quotes are for a single delivery. If split deliveries are requested or needed additional charges will be made for each delivery. Delivery may be made by several couriers if goods on your order are from separate sources. Unless collection is requested, delivery will be made and will be chargeable on orders under £100.00. If you do not receive delivery when we say you will or if your order is received incomplete or damaged, please inform us immediately. If you do not inform us within 24 hours of any shortfall or damage we will not be held responsible for it. Our "buying guides" section of our website should be read in detail prior to ordering. If you have received a product which you believe to be faulty, please telephone us in the first instance on 01606 888520. Many of the products we sell are technically complex, and talking to us about your product may resolve a technical issue easily and efficiently. If we cannot resolve your issue and the product is believed to be faulty and within the manufacturers warranty period (usually one year), please contact us to arrange a returns note for your faulty product. Your date of purchase, invoice number and product codes will be required for us to process a returns note. We will also need details of the fault. Once a returns note has been issued the faulty product must be returned to Cheshire Hardware within the manufacturers warranty period. We advise you to obtain a proof of despatch and proof of cost of return. Upon receipt, the goods will be inspected and tested at our premises to establish any fault that may exist. If necessary, we will return the product to the manufacturer for investigation and to establish whether there is a fault. If a fault is found, a replacement will be despatched to you as soon as possible, subject to availability. We will advise you of expected despatch dates for replacement items. We will also then refund costs deemed reasonable of returning the faulty item to us. We require proof of postage costs in order to refund you correctly. Replacements for faulty items will be delivered free of charge. If no fault is found we will return the goods to you and this delivery will be chargeable to you. For speed and convenience you may wish to order a replacement first and then send the original item back. If it is deemed to be faulty we will then refund the original item as per the above terms. Please note that no finish guarantee is offered on products fitted in a coastal or otherwise caustic environment. If you wish to cancel your order, please inform us as soon as possible. We will require a written notice of cancellation to the company by post, fax or email using a returns note. If you call to notify us of your wish to cancel your order, we will also require written notice of your cancellation by post, fax or email. The customer is responsible for the cost of return of unwanted goods and in the meantime must take reasonable care of the goods. We strongly advise the use of a signed for, trackable service to return your unwanted items to avoid any delays in processing your refund where applicable. A refund will be given on receipt of the returned goods and on approval that the goods meet the criteria for return under this policy. A returns note must be included which is available from us. Please note that orders for non-standard items which have been specially manufactured to the consumer's agreed specifications and delivered as per these specifiactions are NOT covered by this returns policy. If you think you have a faulty item, or your goods become faulty within the warranty period, then please contact us immediately. A replacement can be sent when your faulty item is returned OR beforehand if charged out in the normal way. A refund can then be given for the return once recieved if tested faulty. See our Faulty goods section above. Specially manufactured, non standard goods delivered correctly and without fault cannot be returned. This includes goods which have been specially manufactured or finished to the consumer's agreed specifications and delivered as per these specifications. Specially manufacturerd Items ordered cannot be cancelled after seven days of the order date or if production has begun. No refund will be given for cancelled orders of specially manufactured items outside of the seven day period. This usally applies to items from Croft, British Handmade, Frank Allart, Samuel Heath, Kirkpatrick, Murano House, Rocky Mountain etc as well as kick plates but special order items can be from other manufacturers too. Note our buying guides referring to finishes. Cheshire Hardware will endeavour to match any genuine price offered by a competitor for exactly the same item if they have the item in stock and available for immediate delivery. A copy of the competitor's quote will be required. Occasionally, prices may differ in the showroom from the internet price. If this is pointed out at the time of purchase then we will honour the lower price other than in situations of genuine error where we will usually re-quote the correct price or withdraw the item from sale. These prices do not apply to sales on account. All prices are subject to VAT at the rate ruling on the date the order is paid for. You must not schedule or commence installation of any item until all goods are recieved and their accuracy and suitability for fitment is established by you. Cheshire Hardware will not accept responsibility for any damage or loss caused by incorrect fitting of goods. Although we are happy to help with technical advice, suitability for fitting is ultimately the decision of the buyer. Other than a product cost refund if appropriate, Cheshire Hardware will have no liability to pay any monies to you by way of compensation for losses, re-fixing of faulty goods or interruption. Goods are intended for use in the UK only. Finishes shown are for guidance only. Many are handmade products and the finish WILL vary even in different batches from the same manufacturer. We suggest you order in one hit rather than in lots. We will not be held responsible for variations in finish. When you place your order online, an order confirmation will be automatically sent to you by email. This confirms only that we have received your order. We will then contact you within 24 working hours to advise you of a despatch date for your order. If we have any queries about the items you have ordered, we will contact you by the most efficient method in order to resolve any issues promptly. If we have any problems fulfilling your order within the time advised on our website, we will contact you with an estimated due date or alternative suitable products. If a delay in supply or alternative product is unacceptable to you, we will refund the cost of your order without delay. We commit to ensuring that your personal information is secure and to ensure this we have put in place suitable reasonable electronic and physical security measures. Your information will not be shared with any third party or used for junk mail purposes. The information in this website is for guidance only and we make no representations to suitability for your intended purpose whatsoever and cannot be held responsible if products are not suitable for your intended purpose. Whilst every effort is made to provide accurate product and availability information,we cannot guarantee stock or accuracy of related graphics. It is your responsibility entirely to check the suitability for purpose of the products purchased. We endeavour to ensure that this website is virus free and cannot be held responsible for any loss of data or loss or damage caused to you by using this website. Every effort is made to keep this website running and we cannot be held responsible for any difficulty or loss arising from it not being available. If you continue to use this website you agree to be bound by these terms and conditions. This website and its contents are the property of Cheshire Hardware Ltd and copyright of Cheshire Hardware Ltd. No copying, duplication or dissemination of the content or graphics used is allowed without express permission in writing.